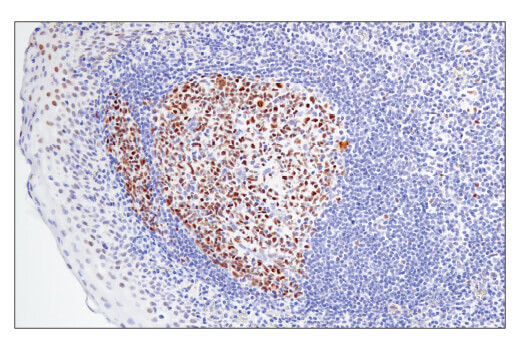 Immunohistochemical analysis of paraffin-embedded human tonsil using BCL6 (E5I8I) Rabbit mAb performed on the Leica® BOND™ Rx. 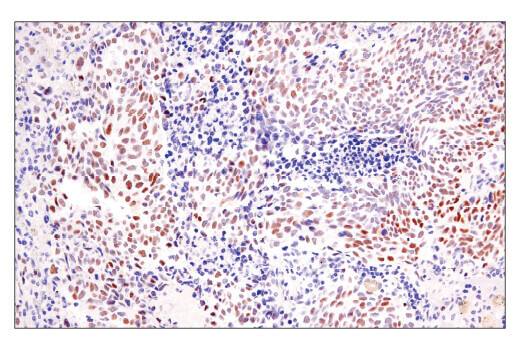 Immunohistochemical analysis of paraffin-embedded human lung adenocarcinoma using BCL6 (E5I8I) Rabbit mAb performed on the Leica® BOND™ Rx. 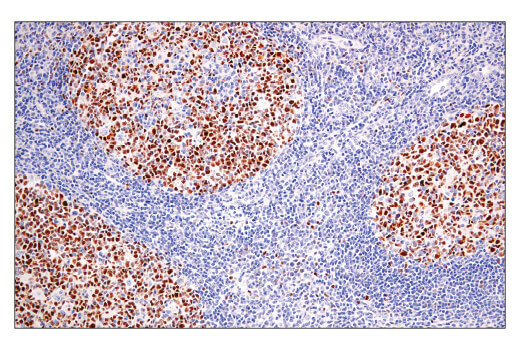 Immunohistochemical analysis of paraffin-embedded human non-Hodgkin's lymphoma using BCL6 (E5I8I) Rabbit mAb performed on the Leica® BOND™ Rx. 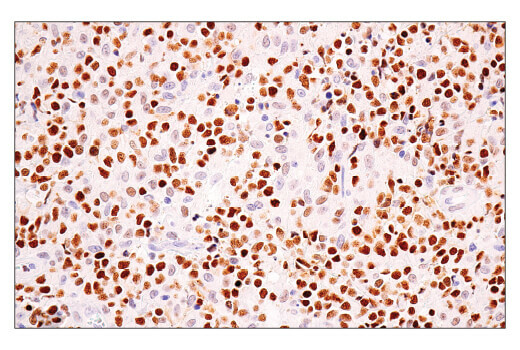 Immunohistochemical analysis of paraffin-embedded human uterine papillary serous carcinoma using BCL6 (E5I8I) Rabbit mAb performed on the Leica® BOND™ Rx. 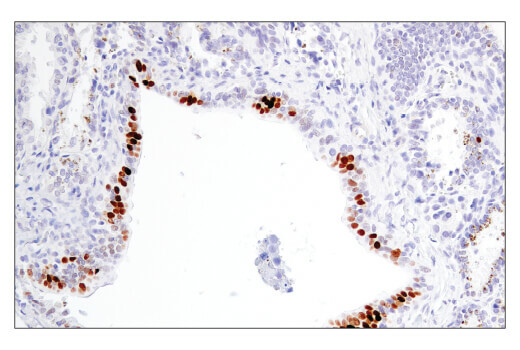 Immunohistochemical analysis of paraffin-embedded human tonsil using BCL6 (E5I8I) Rabbit mAb. 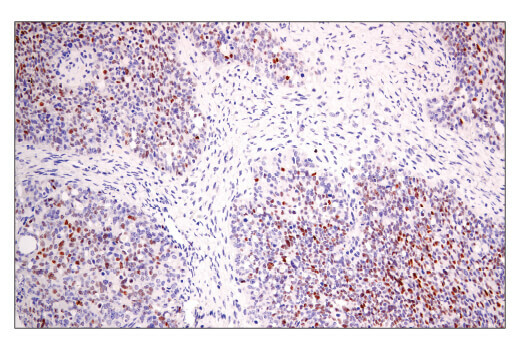 Immunohistochemical analysis of paraffin-embedded human prostate adenocarcinoma using BCL6 (E5I8I) Rabbit mAb. 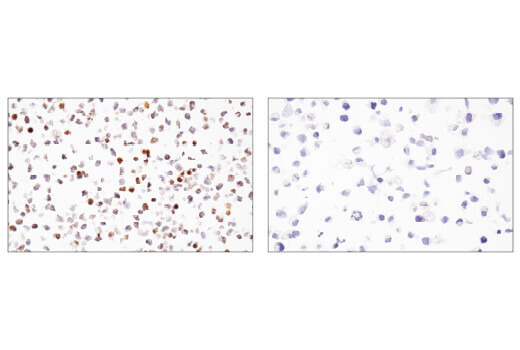 Immunohistochemical analysis of paraffin-embedded Ramos cell pellet (left, positive) or RD cell pellet (right, negative) using BCL6 (E5I8I) Rabbit mAb. BCL6 (E5I8I) Rabbit mAb recognizes endogenous levels of total BCL6 protein. It is predicted to detect both known isoforms of human BCL6. Non-specific, non-nuclear staining was observed in human and mouse smooth muscle. Additional non-specific staining was observed in other mouse tissues. Monoclonal antibody is produced by immunizing animals with a synthetic peptide corresponding to residues surrounding Pro319 of human BCL6 protein. Chromosomal translocations result in misregulation of the proto-oncogene BCL6 in patients with B cell-derived non-Hodgkin's lymphoma (1). The BCL6 gene is selectively expressed in mature B cells and encodes a nuclear phosphoprotein that belongs to the BTB/POZ zinc finger family of transcription factors (2,3). BCL6 protein can bind to target DNA sequences of Stat6 and, analogous to Stat6, modulate the expression of interleukin-4-induced genes (4). Furthermore, BCL6 restrains p53-dependent senescence, making BCL6-active tumors functionally p53-negative (5). The mitogen-activated protein kinases, Erk1 and Erk2, but not JNK, phosphorylate BCL6 at multiple sites. Phosphorylation of BCL6 at Ser333 and Ser343 results in degradation of BCL6 by the ubiquitin/proteasome pathway in B cells (6,7). In addition, BCL6 is acetylated and its transcriptional repressor function is inhibited by the transcriptional co-activator p300 (8). Ye, B.H. et al. (1993) Science 262, 747-50. Onizuka, T. et al. (1995) Blood 86, 28-37. Zollman, S. et al. (1994) Proc Natl Acad Sci U S A 91, 10717-21. Harris, M.B. et al. (1999) Mol Cell Biol 19, 7264-75. Shvarts, A. et al. (2002) Genes Dev 16, 681-6. Moriyama, M. et al. (1997) Oncogene 14, 2465-74. Niu, H. et al. (1998) Genes Dev 12, 1953-61. Bereshchenko, O.R. et al. (2002) Nat Genet 32, 606-13.